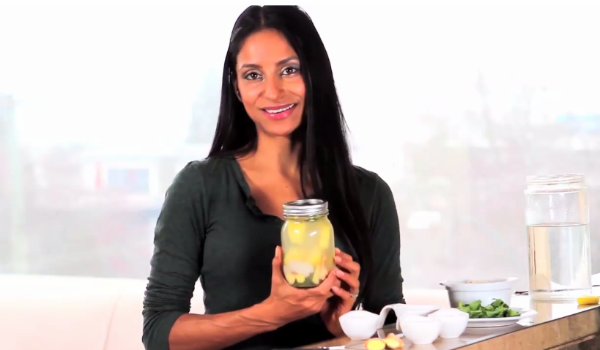 Zain Saraswati Jamal, mind, body, and spirit coach, makes her own healthier vitamin waters. These improve digestion, boost hydration, increase mental clarity, and nourish cells. Superfoods like ginger, mint, pineapple, lychees, and lemon grass provide the nutrition and flavor so you can energize, detoxify, renew, and regenerate. Add lychees, mint, lemongrass, and ginger in glass jar and smash a bit. Then add pineapple, probiotics, salt, and alkaline water. Seal jar and let soak between 4–72 hours before drinking.